As 2018 enters the home stretch, has your dealership grown the way you envisioned it would earlier this year? Are you on the right track? Do you need a way to sell more vehicles with not a ton more effort? If you answered yes to any of these, then you need to check out AutoRevo’s new automated Craigslist posting tool. 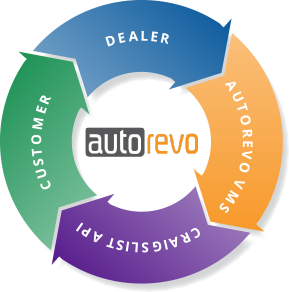 This tool is the game changer that your dealership is looking for. Unlike other tools on the market, AutoRevo has partnered with Craigslist to create the automated tool to end all tools. Without the need for any extra 3rd party posting tools and harnessing the awesome power of Craigslist’s built-in API, the AutoRevo automated posting tool is sure to have leads calling your phone and vehicles flying off of your lot. You get all the benefits of the best, most relevant, and searchable ads in the industry with none of the frustration of intermittent outages dues to Craigslist posting changes. Our tool is fully integrated with Craigslist and works flawlessly. If you’re ready to make this year your best ever, check out the new and improved AutoRevo automated posting tool, with built-in Craigslist API.